Post-dinner bathroom selfie, representing the cool, subtle atmosphere of Tanta. 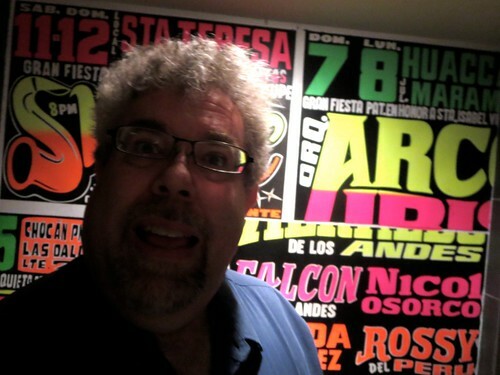 Peru is the future, the international culinary press tells us. Bilbao is apparently over, twigs in Denmark and Norway are so last year, but Peru is the coming thing, says the S. Pellegrino Top 50 List, and just as this improbable announcement happens Chicago gets an outpost of a chain from one of the top chefs in the country, Gaston Acurio. Yes, it’s a chain, Acurio has some 60 restaurants or something, but still, there are high hopes for this culinary consulate in Chicago that seem mostly to be realized— Sula likes it, Vettel likes it okay, Chicago mag’s crew likes it so much that it snags the #3 spot on their best new restaurants list. I walk in and it’s a small, noisy place, half-full in the restaurant but full at the bar. In other words, it’s River North. My dining companion is not here yet so I’m told to take a place at the bar. I walk over to the two open seats and… there’s a Reserved sign on them. Seriously? Reserved at the bar? Did they not know this when they sent me to take them, ten feet from the host stand? We take a very long route for such a small restaurant, past many attractive and comfortable empty tables, to be told to squeeze into a 2-top in a middle of a row of them, the kind of table where getting up at the end bears a strong resemblance to a game of Jenga. Just to see what happens, I pretend to misunderstand and take the marginally more desirable, equally unused table at the end, where I’ll only be elbow to elbow with one side and have a nice comfy divider on the other. Our waiter comes out shortly and he launches into the kind of speech that you get at T.G.I. Friday’s. (Need more flair, kid!) Our menu is divided into large small plates and small large plates and small large shrimp boats and large small small large family platsters and Peruvian food brings you the taste of many cultures including China, Scotland and upstate Saskatchewan and we suggest starting with nine cebiches, eleven shrimp boats and a plate of our Jack Daniels Jalapeno Ranch Dressing Potato Skins topped with an entire marlin. I may have gotten that last one confused with an item at Guy’s American Kitchen. We wait for him to leave and then discuss amongst ourselves; Anthony had been once before so he has some idea of what we might want. The waiter comes back and we order a cebiche and something or other involving octopus. “That’s a great start, and should I put in an order of our Cheesy Cinco de Gallo Muy Latin Potato Bark Scrumpins as your third item?” he upsells, desperately, hope against hope that tonight, he will make his numbers and not have to sleep chained in the basement where, late at night, you hear the scratching and the unearthly cries. 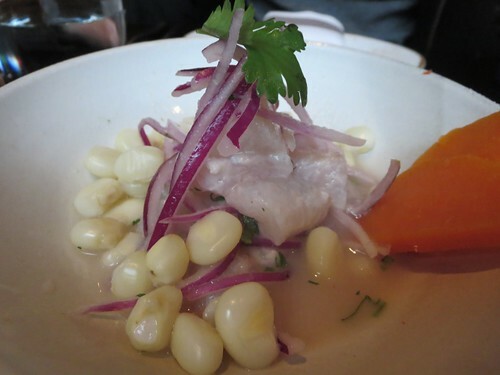 Fluke cebiche. Although this was full of flavorless, styrofoam-peanut-like white corn things, to make it look bigger, the fluke itself was nice and delicate and the tangy liquid was just so and, if you wanted an argument for Peruvian cuisine, this was the best one of the night and reasonably priced for the quantity. If only they hadn’t felt the need to tell us to eat it with a spoon like soup (Would Monsieur care to use silverware rather than his toes? ), which instantly cheapened the experience of some sashimi-level fish. 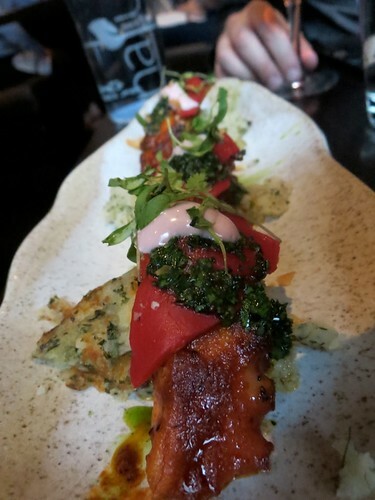 Pulpo anticucho. This was advertised as skewers. It came out looking like an 8-year-old trying to make something like sushi, using mashed potatoes for the rice. We hadn’t drunk enough yet to need fried potatoes with every course. Chaufa aeropuerto. Mike Sula had praised this pork and rice dish in the Reader. Which turns out to make perfect sense, inasmuch as he loves Korean food and the name the rest of the world knows for it is dolsot bibimbap. It was a perfectly decent rendition, comfy and unchallenging, lots of nice crusty rice. And $23 for something that goes for around $9 around town. Anthony thought that it was tamer than it had been before, when there was more complexity to what little spice it had. Adobo de res. 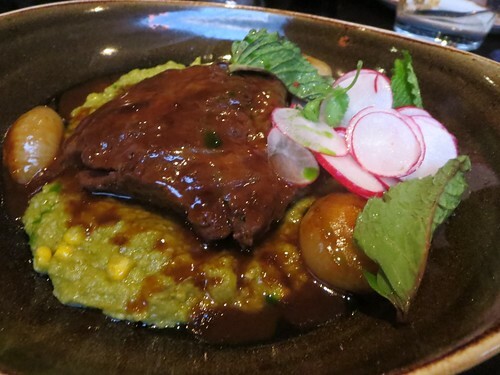 The beef cheeks in this dish were cooked beautifully, and the sauce would have been fine in a French bistro, the only problem here was that any promise of Latin spicing went unfulfilled (the sauce was supposed to be adobo sauce but only had the slightest, the cilantro-pepian goo around it was overly sweet). Nothing was terrible, but nothing seemed focused either, nothing seemed to even reflect the same culture as we ping-ponged from Mexico to Korea. Nothing after the cebiche seemed to come from any tradition deeper than “Hey drunk Americans, here’s a mess of fried potatoes.” We went in looking for a new cultural experience (which Anthony feels he had at that first early visit), we found, basically, a Señor Frog’s for adults, another Mercadito, the same old Latin cliches of a muy bueno good time mi amigos, with Piscos instead of margaritas, apparently dumbed-down and ironed flat since opening for who their customers in River North really are. If this is the future, ay caramba.